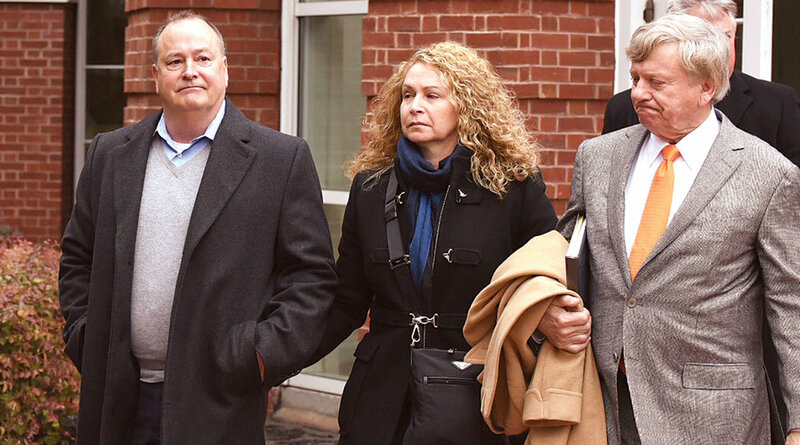 Former Pilot President Mark Hazelwood (left), accompanied by his wife and his lead attorney, Rusty Hardin. Yesterday afternoon federal prosecutors laid out their case against four former Pilot employees—two executives, Mark Hazelwood and Scott Wombold, and two regional account representatives, Heather Jones and Karen Mann. Today, Pilot Flying J put their deep pockets to work. Lawyers representing the defendants made their opening statements and sought to explain, deflect, dismiss, and reframe the allegations made the previous day by the government’s lawyers. Former Pilot President Mark Hazelwood’s attorney, Andy Drumheller, was the first to speak. Drumheller, a masterful trial practitioner and partner at Houston-based Rusty Hardin & Associates, has successfully represented a number of high profile defendants—Drumheller secured Roger Clemens’ acquittal on all charges in his 2012 perjury trial, for example. Drumheller began his statement by returning to a dramatic moment in the Pilot case, April 15, Tax Day, in 2013, the day that federal agents stormed into Pilot’s Knoxville headquarters. Hazelwood was at Tyson McGee Airport, about to board a Pilot corporate jet, Drumheller said, when he got a phone call from an agent who wanted to speak with him. Drumheller went on to describe the rise of Mark Hazelwood and Pilot, tied at the hip since 1985, when he first joined the company, giving him credit for many of the innovations that transformed the industry following the Reagan-era deregulation of trucking. Pilot had 100 convenience stores when they hired Hazelwood, and he helped grow the company to a national network of 750 locations—Jimmy Haslam III called Hazelwood “the principal architect of the national truckstop strategy”, called Drumheller. Then the other shoe dropped. “Why would Mr. Hazelwood spoil the company he helped build, the company he dedicated so much of his time to, the company he identified with so strongly?” Drumheller asked, letting the question linger in the silent courtroom. Then Drumheller began disparaging the evidence the prosecutors had promised to bring before the jury. “The government is going to cherrypick a fraction of those 8,000 trip reports,” he said, referring to the mass of documents that Hazelwood had his subordinates produce to record their meetings with customers. Yesterday, the prosecutors told the jury they planned to use the trip reports to show how Pilot had agreed on specific fuel rebates with customers, only to slash the discounts later, without the carriers’ knowledge. The names of many of the Pilot employees who have already plead guilty and who are cooperating with the prosecution have been floating through the opening stages of the trial, and Drumheller wanted to make sure the jury knew exactly what he thought of them, too. “One of those informants has been paid by the government, tens of thousands of dollars, for services rendered,” he said, emphasizing the last phrase. “The other one has his hand out”—here Drumheller held out his palm toward the prosecutors seated just feet away—“waiting for a payment.” In the end, Drumheller said, Mark Hazelwood was a pioneer, and an innovator, and “a sharp-elbowed negotiator”, but he did not join a conspiracy to commit fraud. Next up was Scott Wombold, Pilot’s former VP of National Accounts. Wombold is represented by John Kelly, the Managing Partner of Bass, Berry & Sims’ five year old Washington, D.C. office. Kelly had a distinguished career for the Department of Justice as a federal prosecutor in New York state and as a deputy of DOJ leadership in D.C. before he went to the private sector. Now Kelly specializes in defending individuals and firms from federal civil litigation and criminal prosecutions. Heather Jones and Karen Mann, the Regional Account Representatives charged in the case, were represented by Ben Vernia of Washington D.C.’s The Vernia Law Firm and Jonathan Cooper of Whitt, Cooper, Trant & Hedrick out of Knoxville, respectively. Their attorneys essentially claimed that Jones and Mann were clerical staff faithfully discharging their duties, were not experts in diesel pricing and relied on outside sales representatives in the field to tell them how to fill out invoices and rebate checks. In total, the four opening statements by the defense asked the jury to believe that tens of millions of dollars of fraud was committed, expanded, and covered up solely by the middle managers who have already pleaded guilty—none of the executives supervising them, nor any of the in-house account managers executing the paperwork had anything to do with the rebate scheme. For updates on the Pilot trial and even more breaking news, subscribe to the FreightWaves daily newsletter.